Arden Highmore is majorly cynical, but even she wouldn’t have predicted the end of the world–or at least the world as she knew it. One winter day, everything modern society has grown to rely on–electricity, cell phones, and, unfortunately, plumbing—stops working. Arden and her best friend, John, flee to his family’s cabin near the Canadian border. On the way there, they’re assaulted by scavengers, but saved by John’s hot brother, Gabriel, who takes an instant dislike to Arden. Review: I can’t tell you how excited I was to read this one. 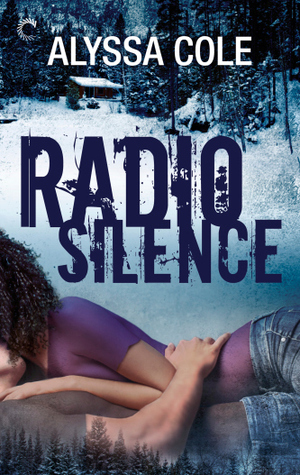 Post Apocalyptic Romance!The cover is amazing and everyone is always raving about it on Twitter. Radio Silence starts off with a bang! Arden and her best friend John are trying to find their way home to John’s family after a cataclysmic event that has knocked out all electricity. As we all know, it’s always our fellow survivors that we have to fear the most, and they see that first hand when two men corner them. It’s a pretty chilling chapter that had me hooked but then…. nothing. Once John and Arden are rescued and make it to John’s home with his surly older brother, Gabriel, and teenage sister, Maggie, things just stagnate for most of the book. Gabriel has a savior complex and is all growly with Arden. Maggie is a surly, bratty teen and they all…argue…and argue…get on each others nerves and…argue again. At first I didn’t really mind because I thought it was an interesting dynamic and kind of cool to show the reality of being stuck together post apocalypse. When you’re smelly, cranky and bored to death. But after that I needed more and didn’t get it. The problem for me, is that it seems Cole couldn’t find the right balance between world building, action and romance. Only one theme could take place a time – so the whole story felt kind of choppy. Awesome premise – just wish the author followed through with it. I guess if you like post apocalypse light maybe with more romance than action this might work better for you. It has RAVE reviews on Goodreads so check it out. I would not have guessed it from the cover, looks more thriller..romantic suspense? Really?? I guess I can see that. You know... normally "...heroine can’t help but lust after because he’s hot..." does make my eyes roll but doesn't bother me... until now. For some reason I'm so over that trope. If I try it, it will have to be at a later time. Have a feeling I'd feel the same as you did right now. Yeah I think you're right. I used to let a lot of things pass that are a no go for me now. Oo I think that would hook me too! And a grumbly hero is one of my favorites! I think I read the sequel to this one...it's John's story. Never read this one though, but sorry you didn't feel the author was able to deal with the various "genres" within the story! I read John's story too and I loved John/Arden in that book so I thought this would be good. Honestly. I didn't enjoy John's story that much either so maybe this author just isn't for me. I'll take your word for it. I haven't read this book but from your feedback I have a feeling I'll pick it apart just like you did and I'd be annoyed with the same thing. That is so funny! Love the premise, what a bummer it felt choppy and the story wasn't able to intertwine. What a bummer that it started out awesome, then fell flat. I hate when that happens! And it sounded SO good. I love a yummy apocalyptic romance. But yay for getting ome books read for the Blogger Shame challenge. I have yet to read one! I did horrible up until March then I managed to read 5 for the challenge. Whoop! I was bummed because it sounded really good. oh this sounds great. Although I do prefer a good balance between plot and romance developments. But I have a weakness for grumpy heroes.